Group work is a highly successful adjunct to individual therapy for boosting self confidence, preventing recurrence of depression and reducing anxiety. The most common difficulty we see is low self confidence / esteem. It crosses the board, from therapists to teachers to GPs, to judges. Low self esteem puts us at risk of many difficulties including anxiety, stress, insomnia, depression, eating problems and more. Often a root cause may begin at 5-18 years and be something like academic criticism from teachers or other adults, academic standards that are too high for children, being unusually bright (when we begin to compete more and more with our own excellent standards), having to compare ourselves with a high achieving sibling etc. As a result, no matter how good our exam results in childhood, or our work in adulthood, we are often very critical of ourselves. Consequently we may drive ourselves on relentlessly towards perfectionism or, exhausted, we may give up. Having invariably begun in childhood/adolescence the difficulties have often persisted for years. CBT can be used to work on improving self esteem and aspects of it remain useful; but newer types of therapy including Compassion Focused and Mindfulness meditation are also showing increasing promise. BCTC staff, including a psychologist and a graduate of the professional training programme have now begun a 10 week group work using the therapies outlined. People worry that they will need to divulge their innermost secrets. Please rest assured that, in this group, you don’t. Additionally, participants sign a confidentiality agreement prior to beginning. The group will run on Thursday evenings from 5.30pm until 7.30 pm and there will be 10 participants. You will meet a caring therapist at the Centre privately for an individual 90 minute assessment prior to joining the group. During this session you can ask any questions. As each group is individually designed to meet the aims of the participants, selection is very important and you will also be asked to state two personal main aims for attending. The fees for each group work session are £45. The fees for an individual assessment are £55 per hour. 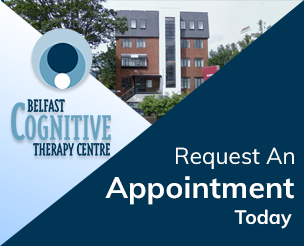 If you have any questions you are welcome to phone our helpful reception staff, Nigel or Alicia on (028) 9065 0060. Please complete the Application Form below to Join Group Work.